AquaGuard Foundation Solutions is a service company with integrity, specializing in foundation repair, crawl space drainage and repair, basement waterproofing, and concrete leveling. When it comes to problems with your foundation, AquaGuard Foundation Solutions has you covered! Whether you have sagging floors, bowed and cracked walls, or uneven floors, their services cover all of your foundation repair needs. They have the professional expertise, services, and products to help you permanently solve your foundation problems throughout the Atlanta area. There is an old saying; "Cheap work isn't good and good work isn't cheap". 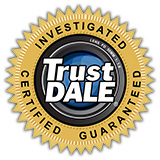 TrustDale finds that with AquaGuard, you get the best of both with products and systems that are unmatched in the industry. Plus, Aquaguard offers a Price Assurance Guarantee that ensures the total price of the project is the lowest price available for the work specified. If a contractor registered with the BBB offers the same standard of materials, quality, and work of equal specifications within 30 days of the original quote, then Aquaguard will match the price plus $100 off with a written estimate. Call them today for a no-cost, no obligation estimate. Why AquaGuard? They have been repairing settling foundations, cracking and bowing walls, sinking slabs and floors with push piers, helical piers, slab piers, wall anchors, stabilizer posts and much more for over 16 years. What's more, AquaGuard stands behind its quality and backs up every job with a nationally backed, transferable, life-of-the-structure warranty, in writing. They also have 28 patented and proven products and systems all on the leading edge of technology. They are part of the largest foundation repair network in the world of over 400 dealers in the U.S., Ireland, England, and Canada. AquaGuard's long history of satisfied customers tells the story with thousands of written surveys and letters saying how happy and satisfied they were with their experience. Some of the most impressive reviews are from customers who didn't do any work because they just didn't need it. When you hire AquaGuard, they aren’t going to tell you that you need something you don’t. If your foundation does not need repairs, then no repairs will be made. This high ethical standard has awarded AquaGuard many times over, from The Torch Award for marketplace ethics and customer service, to more than 10 Consumers’ Choice Awards.